After a tough few years, the sandwich giant is taking a deep look at its locations and ownership. For most of its 50-year history, Subway enjoyed nearly uninterrupted unit growth on its way toward becoming the most prevalent restaurant chain in the world. But, after five years of customer count declines in its vital U.S. market, the Milford, Conn.-based sandwich giant is trying a different tack: shrinking. Company executives said in an interview with Restaurant Business they expect more closures in the near future as the chain employs data to determine the viability of each of its nearly 26,000 U.S. locations. 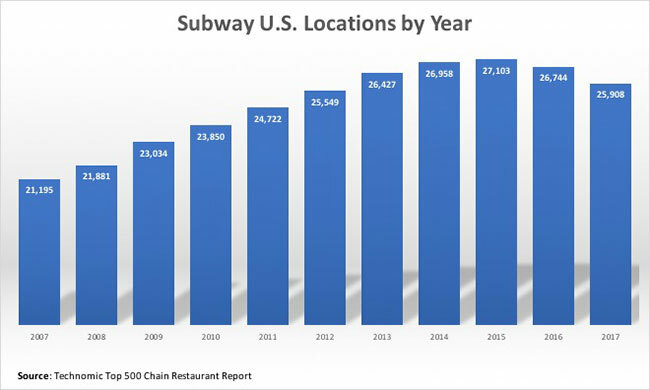 The company also predicts a number of its restaurants will be moved to new, better locations—Subway expects to relocate 1,000 of its global restaurants this year, half of them in the U.S. In addition, the chain foresees as many as 15% of its franchisees selling restaurants to multiunit operators who want to expand—potentially shifting ownership of thousands of locations. The effort could have a major impact on the sandwich giant’s size and franchisee ownership. But executives believe it’s an important element to help the chain improve unit volumes and profitability. Subway’s traffic has fallen 25% since 2012, a decline that put a brake on that uninterrupted growth. 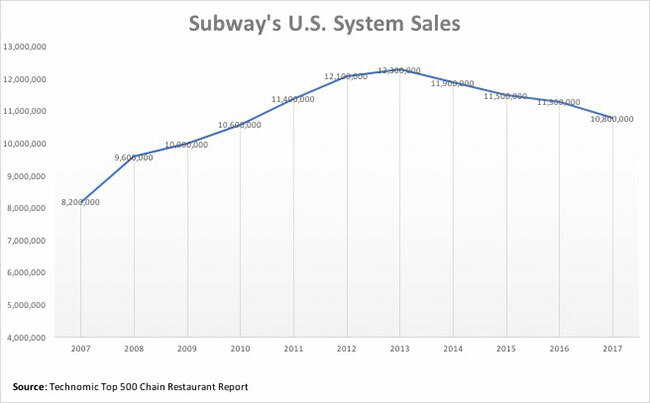 Last year, according to Technomic’s Top 500 Chain Restaurant Advance Report, Subway’s system sales in the U.S. declined 4.4% to $10.8 billion—its lowest level since 2010. Its unit count declined by 3.1%, to 25,908. It was the second straight unit count decline after more than 20 years of increases. The chain has closed 1,200 locations over the past two years. The sales challenges came to the fore late last year when franchisees protested the chain’s $4.99 Footlong offer. “With anything new, like a brand transformation, that means change,” Greco says of the chain’s relations with franchisees. “When you change things, people get concerned and there’s debate. Our key strategy is to open up our lines of communication and listen to them. Greco took over as CEO of Subway in 2015. She had been involved with the chain since 1973, when she started as a sandwich maker, and had held various roles with the company. But after DeLuca’s 2013 leukemia diagnosis she was given more and more responsibility, ultimately becoming only the second CEO in the chain’s history. “When I came on board, we had a huge challenge, with the passing of Fred,” Greco says. Already hurting from the loss of customers, the company was ready for some change. Subway performed an evaluation of its business, and looked at how to turn it around, she said, knowing that the down traffic meant starting from a tough spot. “We were already losing customers when we started our transformation,” Greco says. “That makes it even more difficult to turn around.” She said that if the work had started before the “slippage,” the company might be in a better position today. The persistent declines in traffic and sales have left the chain with unit volumes that are low—at just over $400,000—for such a large company. While Subway has been built to be profitable even with low volumes, the sales have put pressure on the chain while leaving many of its franchisees in danger of going out of business. Meanwhile, smaller rivals such as Jimmy John’s and Jersey Mike’s kept growing. Jimmy John’s U.S. system sales grew by 6.2% last year, according to Technomic. Jersey Mike’s, meanwhile, has been one of the industry’s fastest-growing chains in recent years. Its system sales grew by 18.2%. A chain that once helped destroy Quiznos by simply adding toasters is now at the mercy of its smaller rivals. Subway largely stopped adding new units after Greco’s arrival in 2015. That alone was a major shift. Operators have said that in the past they were given little choice but to build new units near their existing restaurants because if they didn’t, others would. The company’s focus now is on “same-shop profitability, rather than location growth,” says Don Fertman, Subway’s chief development officer. Under Greco, the company developed its own modeling software, using a mapping program to assess individual locations. It is analyzing stores to determine which would be best to relocate, sell to other franchisees or close. Operators who relocate into new facilities with a better footprint “are seeing phenomenal results from that action,” he says. Subway did about 500 such relocations in 2017. Fertman says the chain expects to double that in 2018, with about half of the moves in the U.S.
Executives also believe the chain needs to close underperforming locations. “We think there will be additional closures,” Fertman says. How many is uncertain. But the company believes that a smaller system will ultimately be stronger. “Over the next five to 10 years, we might see fewer restaurants but a stronger, more robust franchisee base and a stronger, more profitable system,” Fertman says. John Gordon, a restaurant consultant out of San Diego, believes that culling locations is an important step for Subway to improve unit volumes. He says the company’s willingness to accept a unit count decline is somewhat surprising. “Typically, this is something the franchisor will fight until the cows come home,” he says. While some units may close, many others could change hands. The company surveyed its operators and asked whether they would prefer to expand or stay where they are—or downsize or exit. Of those operators, 15% said they wanted to downsize or exit—that would represent at least 4,000 stores, if that were true systemwide and every operator had one location. Executives emphasized the system will still feature small, one-unit operators. “Some of those people are some of the hardest-working operators we have,” Greco says. The company also expects new franchisees in the system who “come into the Subway system and get excited and bring new energy,” Fertman says. But larger operators get more sophisticated over time, building organizations that can be more efficient. And larger operators might also be able to pay for remodels. Subway is banking on remodels, which could be an extensive program, given the sandwich chain’s immense scope. But it could also be challenging, given the restaurants’ low volumes. The company said it has financing options and has worked with operators to offset the costs of the remodel. Subway also says that the design is available in different tiers and price points, so smaller-volume stores can more easily afford the remodel. Matt Starr is undertaking a number of the store transformations that Subway believes can help the chain thrive in the future. Starr has been a Subway franchisee since 1988, and his company owns about 70 locations around the country, about half of which are in the Portland, Ore., area. Two years ago, Starr took over a Subway in a poor location with an owner who was “tired and disengaged.” With better operations, he says, the store’s sales increased 20% in the first year. And in the meantime, the company found a better location for that restaurant that was “about a 9-iron” away. “Seriously, it’s about a half a block,” Starr says. Starr is repeating the process in other locations. One of his business partners took over a high-volume shop in Portland, remodeled that location and has seen sales increase more than 50%. Starr believes that the remodel is a “major component” of the increase, in part because customers want to stay longer and they are amazed at seeing the company slice its fresh vegetables. “People come in and ask, ‘Do you really slice your veggies?’ That happens at every single Fresh Forward shop,” he says. 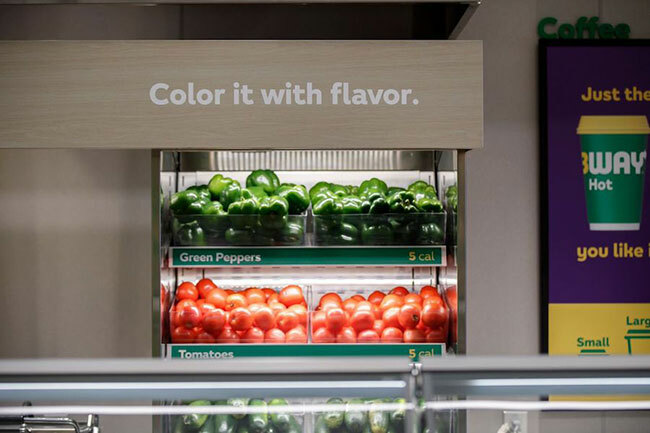 Subway’s revitalization strategy includes a number of different elements beyond the remodels, including more marketing earlier this year to promote the chain’s healthfulness. The chain’s primary shareholders, including Peter Buck and DeLuca’s family, invested $25 million into the chain to support that marketing. Late last year, Subway named Dentsu Aegis Network, a customized team of ad agencies, to handle its creative and media accounts. The company has a new campaign that focuses on the chain’s customization platform and its fresh ingredients. The chain has also been focused on its digital efforts, including its mobile app and a new loyalty program. The $4.99 offer was part of that strategy, part of a way to combat intense discounting in the quick-service sector. But concerns about profitability roiled franchisees and they fought back, petitioning the company to stop the offer. According to Technomic Transaction Insights data, Subway lost market share in January, suggesting the deal didn’t click with consumers. Subway is quietly launching a set of wrap sandwiches, with double the meat, for $6.99, that executives hope can serve a more premium customer looking for something a little different. Greco suggests that the company still has a way to go. Subway is still the biggest chain in the world by unit count, and a fix of its sales takes time. “When you think of the size we’re dealing with, we have the makings of a brand transformation plan,” she says. But Greco believes the company could be at a turning point on its turnaround. “All of this stuff coming together at once gives us a platform,” she says. “We’re excited about what we have in the future at Subway. We’re a big brand. It took us 50 years to get here.